ajayw is a freshman in SMTD and Economics. It is his first year reviewing for art[seen]. As a music student, ajayw takes great interest in reviewing the music events on campus, especially those brought in by UMS. The Israel Philharmonic’s visit to Hill Auditorium had been on my radar as a performance I knew I wanted to see since UMS released their schedule last year. The original plan was for the orchestra to be led by Maestro Zubin Mehta, a man who is probably the most successful Indian Western classical musician of all time. Unfortunately, due to health reasons, Maestro Mehta was sidelined for this event, so Maestro Yoel Levi had to conduct in his place. While Maestro Levi was certainly more than qualified to lead the Israel Philharmonic, a concert conducted by him simply doesn’t have the same allure as one conducted by Zubin Mehta, a veritable giant in the classical music field. Levi brought excitement to the performance as any good conductor should, but, in my opinion, the amount of technical errors made by the orchestra overshadowed the great energy on stage. The program started with the playing of the US National Anthem, followed by the Israeli one. Unfortunately, those were the best pieces they played on the concert. They started off the real program with a piece for string orchestra. It was fine, overall. I didn’t notice any major flaws or anything, but to me it just felt kind of boring. This could have been due to the piece as opposed to the players, though. They followed it up with Schubert’s third symphony to round out the first half. It was OK, again. My main gripe with this piece was the timpanist’s muting. Every time he hit a note, there was a sharp, audible cut off an eighth note later. As a timpanist myself, I can attest that nobody should be making that much extraneous noise, regardless of the style they choose to play or musical background they come from. It distracted me so much from the rest of the piece that I couldn’t focus on anything else. Most people in the audience probably didn’t even notice, but to me that was a huge red flag. The second half of the program was Tchaikovsky’s 6th symphony, a masterwork. Every major orchestra has played this piece a million times and Israel certainly cannot be an exception to that. Because of this, I am baffled at how many mistakes they made. Every time there was a run in the strings or brass, there was absolutely no clarity because they were simply not together. To make matters worse, there were times when the strings would finish a run and we would be left hearing an incorrect chord. The brass sounded kind of thin which cannot happen when playing powerful music like that of Tchaikovsky. The timpanist redeemed himself to an extent on this half. His strong playing led the orchestra through their best moments of the piece. Unfortunately, he had some tuning troubles. He was checking the low drum at intermission with a tuner, so maybe there was some sort of equipment malfunction, but it sounded out of tune at multiple spots. It was just disappointing to see a world class orchestral play such a standard piece with so many mistakes. The clarity issues could have been a result of a lack of familiarity with Hill Auditorium, an acoustically superior, yet really weird place to perform. The other mistakes don’t really have a justification, in my opinion, though. The encores were solid, but nothing special. They performed “Nimrod” from Elgar’s Enigma Variations and the “Waltz” from Tchaikovsky’s Swan Lake. Just when it seemed as though the orchestra was about to redeem itself with an exciting rendition of the waltz, the end fell flat. As the rest of the orchestra hit an accelerando to end the piece, the low brass fell behind and simply couldn’t hang. Overall, it was a fitting end to an underwhelming performance by a group that I can only characterize as overhyped. This past Wednesday night, UMS brought in jazz guitar legend Pat Metheny to play on the Hill Auditorium stage. He delivered a performance that was incredibly interesting and complex to listen to. The night started with a solo piece by Mr. Metheny on what was probably the strangest guitar I have ever seen. It looked like a regular guitar for the most part with a half of a short extra guitar stacked above the regular one. In addition, there seemed to be other sets of strings on the body of the instrument and there might have been a kalimba or something hanging off the end. It was hard to see everything because the strings were clear, but the sounds he made on whatever this hybrid instrument is called were absolutely wild. He went on to improvise for about 7-10 minutes and it was all really interesting material. He made it clear from the start why he is considered such a huge name in the jazz world, especially regarding jazz guitar. After the opening improvisation, the rest of his band came out featuring a pianist, a string bass player, and a drummer. From what I could tell all of the band members sounded fantastic. They had multiple solo opportunities and were clearly more than qualified to play with a talent on the level of Pat Metheny. I paid close attention to the drummer in particular. His groove was really solid and he was jamming a lot, but the chops he showed off were pretty insane. Throughout the performance, they deviated from the full band set up with some smaller arrangements of the ensemble. Pat played on at least 6 guitars throughout the night. I tried to keep track, but it proved to be too tall a task with a stagehand coming out every few songs to switch them out. They all had a distinct character and suited the vibe of the music perfectly. At one point in the performance, he took a minute to address the audience and explain that he really enjoyed his current tour because it wasn’t to promote an album or anything like most tours are. He’s just touring to have some fun and play some old tunes that his most die hard fans love to hear. He then reverted to telling a kind of awkward story about how he loves this area because he loves Detroit. Artists often try to establish a connection with a local crowd with a personal story about the area they’re playing in, but I just didn’t feel like his was necessary. Overall, the concert was well worth attending and the music was great. However, I think it was too long. The projected time of the concert in the email UMS sent around to ticket purchasers about the concert was 2 hours and 40 minutes with no intermission. Everyone in attendance that night definitely loved the music of Pat Metheny, but, in my opinion, 2 hours and 40 minutes of sitting and listening to music is way too long without a break. On Wednesday night, Hill Auditorium will play host to the legendary jazz guitarist, Pat Metheny. Pat is truly a pioneer of modern jazz guitar. He has a distinct improvisatory style that is admired by many and has helped him earn 20 Grammys. While his compositions are mostly jazz, he has the musical skill to delve into other genres and create great music for them. In fact, last year, he wrote a concerto for two percussionists that the Philadelphia Orchestra premiered with their Principal of Percussion, Christopher Deviney, and world renowned marimba soloist She-e Wu. In addition to his collaborations with musicians of other musical genres, he has worked with some of the biggest names in jazz including Ornette Coleman, Gary Burton, and Herbie Hancock. In addition to his 20 Grammys, Metheny has a host of other accolades to his credit including induction into the Downbeat Hall of Fame and becoming the youngest person to earn the title of NEA jazz master. This performance promises to be one of the best musical performances put on by UMS this year. The show starts at 7:30 with no intermission. There are still tickets available! Last night, the University of Michigan’s historic Hill Auditorium served as host to one of the greatest orchestral ensembles in the world: the Philadelphia Orchestra. As one of the most recorded American orchestras of all time, the Philadelphia Orchestra is generally considered to be part of the “Big 5” American orchestras along with Chicago, New York, Cleveland, and Boston. After their performance in Hill last night, it was easy to see what all of the hype was about. They opened the concert with a piece by Nico Muhly, a newer composer who incorporates a lot of cool minimalist concepts into his music. He combined beautiful moments that could have been part of a Tchaikovsky symphony with a lot of instances of almost atmospheric sounding music where it seemed like nobody really knew what was going on except the orchestra. The piece features a lot of percussion, and the Philadelphia Orchestra’s section is one of the best. There were many tricky xylophone and vibraphone licks accompanied by huge booming moments from the timpani and bass drum. All in all, they did a great job with what seemed to be a complex and challenging piece. After the Muhly, the orchestra performed Tchaikovsky’s Violin Concerto with world renowned violinist, Lisa Batiashvili, as the soloist. Her playing was electric. Honestly, in terms of interpretation, it wasn’t my favorite rendition of the concerto, but nobody can deny how great her sound was, especially when combined with the lush background provided by the orchestra. The audience loved it so much that Ms. Batiashvili received a more raucous applause after the first movement than most orchestras do after a whole concert, prompting Yannick Nezet-Seguin, the music director, to turn to the audience and say “There is still a second and third movement”. After ending the piece in an energetic fashion, Ms. Batiashvili and the orchestra were met with an even more enthusiastic applause than the one before and an almost immediate standing ovation. As an encore, Yannick and Ms. Batiashvili performed a song for voice and piano by Tchaikovsky that Mr. Nezet-Seguin adapted for piano and violin. As expected, it was performed beautifully and the audience erupted once more to take the concert to intermission. The first half encore also served as a reminder that Mr. Nezet-Seguin will be coming back to Hill to perform as a pianist with a renowned soprano, a concert sure to be well attended by those who viewed this one. In the second half, the orchestra performed Rachmaninoff’s Symphonic Dances, a somewhat newer 20th century masterwork that epitomizes the type of music this orchestra is traditionally known for recording. It was phenomenal. The louds were enormous and incredibly exciting. Seemingly every member of the orchestra had a solo at some point and they were all executed to perfection. The principal trombonist, especially, impressed me. Something about his sound was just exactly what I wanted to hear from his instrument. Hill Auditorium is a huge hall that hides the articulation from low instruments, but the timpani and low brass sounded absolutely incredible and everything I heard them play was clear as day. The strings really shined as they played through the sweet soft sections interspersed throughout the piece. Overall, this was easily the best rendition of Rachmaninoff’s Symphonic Dances I have ever heard. Just when the audience thought the night could not get any better, the Philadelphia Orchestra decided to wow the Ann Arbor crowd with their encore selection. They played “The Victors”. It probably sounded incredible, but I don’t think anybody really knows because the whole audience was clapping and singing along, overjoyed that they decided to play our fight song. To top it off, the percussion section broke out Michigan hats and scarves while the tuba player, a Michigan alumnus, clapped and fist pumped along with the audience. The whole encore was quite a spectacle and served as the perfect end to one of the best performances I’ve seen at Hill. The concert given by the jazz legend Chick Corea and the Jazz at Lincoln Center Orchestra was a spectacular experience overall and great opportunity to see some classic jazz tunes in a new light. In spite of the start time of the concert falling just after the conclusion of the Michigan Men’s Basketball team Final Four game, the audience at historic Hill Auditorium was full and eager to see one of America’s best big bands perform live. This tour was the first to feature the JLCO without their music director and regular frontman, Wynton Marsalis. Because of their top tier status, the orchestra has the luxury of switching one legend to lead them for another. The band consisted of four trumpets, four saxophones, three trombones, a bass players, a drummer, and Mr. Corea on keys. The concert opened with a Chick Corea classic, “Armando’s Rhumba”, as arranged by the bass player of the band. It was not a traditional performance of Chick Corea’s music because it was originally written for the instrumentation of various jazz combos he has played in. A jazz combo usually only consists of a few members while this big band had 15. In his performance at Hill, his pieces were shown in a whole new light as arrangements for big band. These specific arrangements were done by members of the JLCO for this tour. Each arrangement had multiple opportunities for solos and the members of the JLCO did anything but disappoint when called upon to step into the spotlight. Just about every member of the orchestra got a solo at some point. Usually, there were three or four soloists on a song across all instrument groups. The song selection for the concert spanned a broad array of different types of jazz. Songs like “Armando’s Rhumba” showed off the Latin side of Corea’s music while a song like “Windows” and “Crystal Silence” showed off some of his most beautiful writing. As a percussionist, I was particularly interested to see how the drummer of the JLCO played both with the group and as a soloist. With the group, his groove was sound and he added tasteful embellishments to it throughout the various songs that only added to the textures being made by the ensemble. At the beginning of the first piece, it was a little hard to hear him, but I think it was probably just a microphone issue because I did not notice it for the rest of the night. As a soloist, he seemed to have the mentality of going into the solo with a few cool ideas and performing variations on them all around the kit. He executed these maneuvers incredibly well, as would be expected for a member of one of America’s best big bands. Every member of that ensemble was up to the level of the drummer both as ensemble players and soloists as well. As amazing as the group was, the audience was there to see the headliner, Chick Corea. Chick was fantastic on every song, leading the band through the intricacies of his music. It seemed as though there was some sort of piano issue that required a stagehand to fiddle with something under his piano a few times during the performance, but he overcame whatever the issue was. What impressed me most about Chick was the respect he had for the other members of the band. Sometimes he had to play background for a solo, but when given the opportunity to watch a band member solo, like the drummer, Chick got out of his seat to actually watch him with a better view. Overall, all of the musicians were amazing and I would highly recommend seeing Chick Corea and/or the Jazz at Lincoln Center Orchestra to anybody who has the opportunity. REVIEW: Logic: Who Can Relate? The Who Can Relate? event was one of the best events I’ve seen in my time on campus. If not for the technical difficulties, it would have been near perfect. The event started off strong with a pre recorded message about mental health by former POTUS Bill Clinton. After the powerful message by former president Clinton, the men’s glee club took the stage. They sang an incredible rendition of “Glory” by Common and John Legend featuring some incredible vocalists on the lead parts. I recognized one of the vocalists as one of the students who did an outstanding job singing in Porgy and Bess. After the last member of the glee club exited the stage, we welcomed actor Glenn Close, founder of the BringChange2Mind charity. Glenn shared a heartwarming story about her sister who was diagnosed with bipolar disorder. She is the inspiration behind Glenn starting her charity. Everything seemed to be going smoothly as Glenn planned to show a video, but then the screen unfortunately fell victim to technical difficulties. In an attempt to buy some time for her video, Glenn sang a song, but it would end up taking them the better part of the mental health half of the event for them to fix the screen. Even though, the video was never shown, the event was so moving it might not have even needed it. Kevin Hines was next up to speak. He knew that most people in the auditorium did not know who he was going into the event and used that knowledge to his advantage with his presentation. Before introducing himself he gave an impassioned speech about the importance of life and then shared his story with us. He is one of less than 40 people to have survived jumping off of the Golden Gate Bridge out of over 2000. It is one of the “most exclusive clubs” one can be in, as he put it. Even more amazing, is that fact that he regained full mobility in his body and suffered no major injuries from the suicide attempt. Upon sharing this knowledge, the entire auditorium fell absolutely silent. After having us repeat “I want to be alive” three times, each with greater intensity, Mr. Hines left the stage to raucous applause. Hakeem Rahim, the founder of I Am Acceptance, gave a series of spoken word pieces that were fantastic. He was followed by Brandon Marshall and his wife Michi to end the purely mental health portion of the event. Brandon personally has borderline personality disorder and talked about the importance of asking for help. I have personally already seen his “A Football Life” documentary where he discusses his struggles with BPD, so it was amazing to see him in real life. After all of the empowering speeches about mental health, it was time for Logic to close the night. There was a short delay where they eventually ended up fixing the screen. 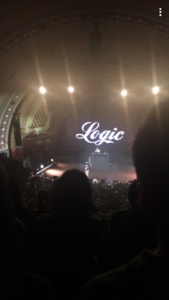 Logic’s DJ came out and warmed up the crowd with 30 snippets of songs that were surprisingly well connected. Finally, it was time for the real deal, Logic himself. He came out with a Maize and Blue shirt on, ready to take over the show. He informed the crowd that this would be his first time performing songs from his new album, Bobby Tarantino II, so, naturally, we went wild. After a great set of mostly new songs mixed with some funny audience interaction and Logic’s spiel about not using our phones, we had reached the song that really embodied the night, “1-800-273-8255”. The title of Logic’s hit is the number for the suicide hotline, and he had been saving it to close his formal set for this event so that he could remind us of what we were all really there for, a gathering in support of mental health. After an amazing performance of that song, Logic decided to play his other hit, “Everybody”, as an encore. The performance he gave was fantastic and the night overall was really moving. This event was one of the best I’ve seen on campus, and I highly recommend going to anything similar in the future.